This privately educated member of the Hungarian and Croatian aristocracy has had her music royally treated by CPO with support from the Croatian Music Information Centre (CMIC). Already reviewed here are other Pejačević CPO discs, including those of the Symphony, the Piano trio and the Piano quintet alongside other chamber works. Not as yet tackled by us are two discs: Lieder (CPO 777 422-2) and violin sonatas (CPO 777 420-2). She was a pupil of Percy Sherwood, an English composer but based in Germany and championed to date only by Toccata. An English language CMIC biography of Pejačević, the composer can be read here. The disc ushers the listener into the composer's world with her last orchestral work, the Overture in D minor. This is vigorous music with an optimistic countryside accent. This mindset is sometimes cut across by a Beethovenian tributary sounding a little like the Egmont Overture. The music also reminded me of Enescu's turbulent First Symphony and the explosive Szymanowski Concert Overture but without those exciting early works' often stifling orchestration. The helpful and accessibly expressed booklet note by Koraljka Kox tells us that Pejačević wrote thirty Lieder; the four songs for voice and orchestra are presented here. They follow the overture after a very tasteful long silence - a sound and artistically informed decision by CPO and its engineer/producer. These Lieder are positively caressed by delicately pointed orchestral detailing, including a touching obbligato solo violin in Verwandlung. Liebeslied receives sumptuous treatment from the composer. If only Janet Baker had discovered this song in her early heyday. As it is Ingeborg Danz is excellent. She is tested by the suitably flighty and very short Schmetterlingslieder and most attractively vanquishes each challenge. These songs - taking up less than fifteen minutes in total - will appeal to those who love their Richard Strauss songs with orchestra whose style they most closely parallel. By the way, mention of Richard Strauss reminds me to commend a now long-deleted 3 CD set (Nightingale NC0000722) in which the under-rated Friedrich Haider conducts all the Strauss songs with orchestra (Nice Philharmonic). The singers there are Pieczonka, Gruberova, Howarth, Petrova, Straka, Skovhus and Moll; quite a line-up. When will that set be reissued? The Pejačević Piano Concerto is in three movements. It is a showy work yet with a serious tone. Written just before the Great War, it clearly comes from the same style-sheet as the Rachmaninov concertos yet with glances cast further back to the Schumann Piano Concerto. 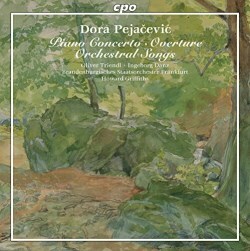 It's not a long distance from this music to Pejačević's post-war Phantasie Concertante recorded by CPO with the Symphony. If you liked the Phantasie you will enjoy this. The concerto runs almost thirty minutes, unlike the Phantasie which is just half that length and a single movement at that. It boasts a true corker of a memorable idea in the middle movement: Adagio con estro poetico. The Allegro con fuoco finale is busy, showy and grand. It lacks some of the gravitas of the other two movements but brings things to a rounded close. Oliver Triendl, who has been a constant across most of these CPO Pejačević volumes, brings both brilliance and a sense of earnest striving. The sound is well up to standard and meets the varying demands of solo voice and orchestra in a way that favours lucidity without compromising the big sound demanded by the overture and the concerto. The notes are straight-speaking and not clogged with CPO's one-time leaning towards academic convolution. There are other places from which to embark upon your Pejačević pilgrimage but this will not let down those who have already started along that path. Given the short playing time I wonder if this is the last in CPO's Pejačević series.